The small penal settlement on Port Jackson, founded in January 1788, had little physical impact on the Central West for nearly three decades. As the Colony grew, the need for more farming and grazing land became acute. In May 1813 William Charles Wentworth, William Lawson and Gregory Blaxland, crossed the Blue Mountains that had so effectively formed a barrier to the expanding settlement. George William Evans was sent by Governor Macquarie to survey the route, reaching as far as the Macquarie River. A year later William Cox, was contracted to build the road across the mountains as far as Bathurst. Although the new road provided an opportunity for large landholders to seek new pastures west of the Blue Mountains, a barrier to further settlement was placed along the Macquarie and Lachlan Rivers. West of this boundary was reserved for government use. Bathurst was founded as a government agricultural station in 1815, using convicts to tend the government cattle. In 1823 a more remote stock station was opened in the Wellington Valley, with an intermediate station set up in the mid 1820s at Fredericks Valley Creek, near the site of Orange. Starvation drove the Wiradjuri to seek food, but the farmers retaliated at the loss of their stock and produce. The situation deteriorated rapidly with strike and counter-strike, with the settlers taking the law into their own hands, seeking to destroy the native population. Martial law was declared on 14 August 1824. Major Morisset, commandant of the Bathurst Penal Establishment, used troops and settlers to kill the Aboriginal population. After four months of bloodshed and notorious atrocities, martial law was repealed on 11 December 1824. Morisset was relieved of his position by Lord Bathurst, Secretary of State for the Colonies. The restriction of settlement west of Bathurst was removed in 1826 when Governor Darling established the Limits of Location, forming the boundary to the Nineteen Counties. This opened up the area beyond Bathurst to pastoral settlement. Within a year of this change, William Lawson senior had selected land at Errowanbang, just south of Cadia. It may be hard for us to realise today that this was on the very edge of settlement in the 1820s. The Panuara Rivulet, west of Cadia, formed the edge of the Settled Districts. Large stations, like the one belonging to William Lawson, depended on convict labour. When transportation of convicts to New South Wales ended in 1840, this cheap source of labour dried up. Circumstances combined to inflict an even harsher blow on the pastoralists. The price for wool on the London market plummeted, bringing on the 1840s Depression for the whole Colony. Circumstances were beginning to improve by 1847, but new sources of labour were soon attracted by a major event – Edward Hargraves and John Lister discovered Gold on Lewis Ponds Creek on 12 February 1851. The gold rush also diverted attention from the large copper deposits in the Cadiangullong Valley. 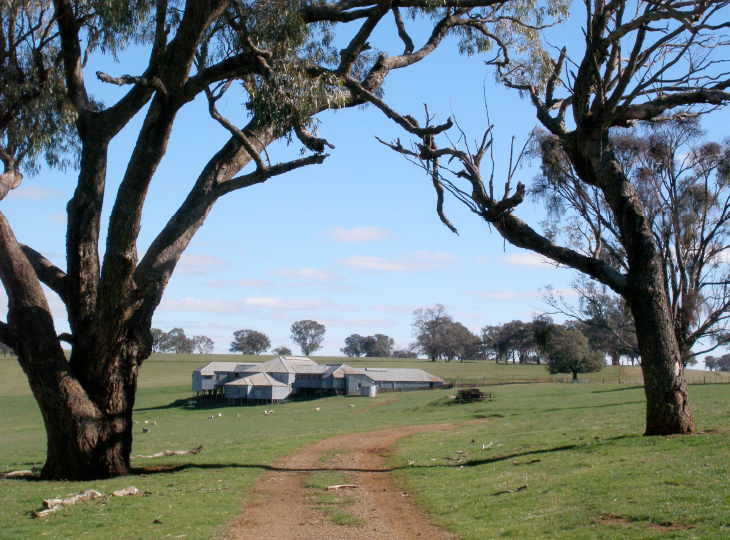 The massive influx of people onto the NSW goldfields eventually resulted in the closer settlement of the rural landscape as former miners and others turned their attention to farming. The second woolshed on Errowanbang, erected in c.1890 (Edward Higginbotham, 2010).